As babies haven’t fully developed their maximum lung capacity or the immunity that most adults have, they’re sensitive to outside factors and sicknesses caused by airborne bacteria, allergens, and more. Babies actually breathe in more air per their size than adults and are more likely to be affected by pollution and especially the side effects of cigarette smoke. Kids with pre-existing health problems or those who have trouble breathing at times are especially prone to suffering. 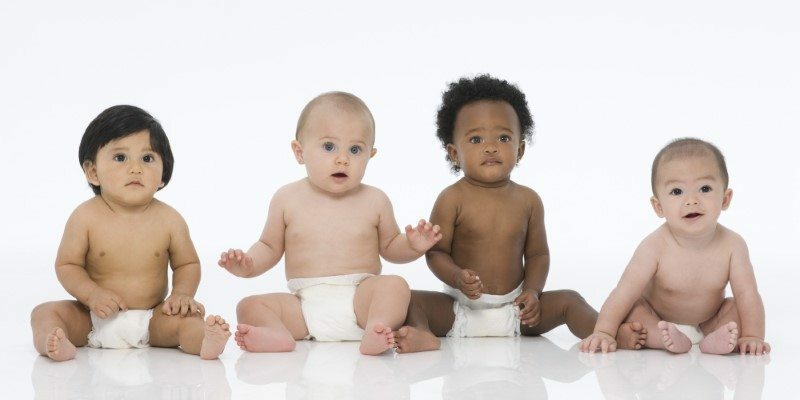 If you’ve been wondering “Are air purifiers good for babies?” the answer is yes! A good quality air purifier isn’t just good for them, but it’s good for a child’s parents as well. Read on to learn more. Very few of us realize it but the air around us often contains a very large amount of pollutants, dust, allergens, foreign materials, organic matter (including pet dander), dust mites, and mold spores. Bacteria can be transmitted through the air as well. The problem is that we can’t see these incredibly small & harmful particles that surround us everywhere and at some point, after sufficient exposure, we can become sick or cough and sneeze as our nose, throat, and lungs become irritated. The real concern comes when a child is enclosed in a room with unclean air for long periods of time. That means a baby’s exposure to potentially harmful particulate matter commonly found in homes rises significantly. To better help you understand have a look at the above image comparing the width of an average human hair to foreign matter in the air. The two particle sizes shown (PM10, PM2.5) are named to represent particle matter of 10 micrometers or less and 2.5 micrometers or less. Now you can better understand how easily these are inhaled by babies – they’re incredibly small (a micrometer is one 1/100,000 of a meter!) are easily inhaled deep within the child’s lungs where they can accumulate and begin causing illness, coughing, or other respiratory problems. Pets, cigarette smoke odors and residue particles, the airborne remnants of a new home, carpet, dust mites, and so much more are introduced into the air and remain there until properly removed. Even if you don’t allow smoking inside your home, smokers can still bring in residual particles from smoke via their clothing & hair into your home and near your baby, risking respiratory problems and a lot of coughing and other reactions. How does an air purifier improve the air for babies? An adequate air purifier works by actually trapping and removing the unwanted airborne elements. In order to do so, a true high-efficiency particulate air (HEPA) filter is used. Typically a HEPA-type filter also works with an additional carbon filter & 1st stage filter to remove odor and larger matter like pet hair and larger dust strands. 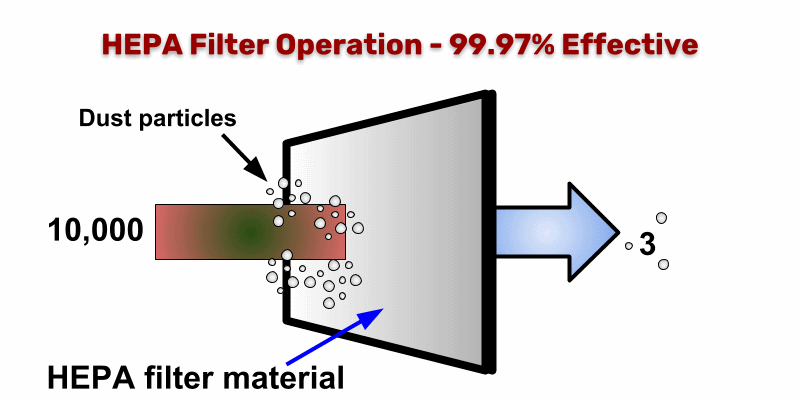 A true HEPA filter is designed to meet standards in which 99.97% air particles and microbes as small as 0.3 uM are filtered and trapped in the filter itself. 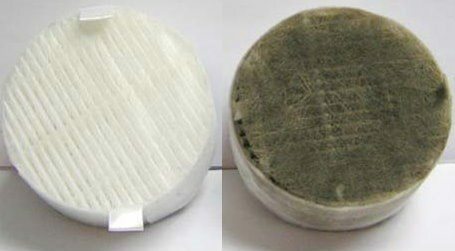 Once filtered, they can never escape and the result is clean, fresh air. An air purifier works by using a fan to pull air through the filters and produce cleansed air to its output vents. As the air circulates in the room, more and more air over time is filtered. Results can be felt within several hours or several days depending upon the size of the room it is used in and the amount of pollutants in the air. To better explain, I’ll use the example case of a moderately polluted room’s air. If a good air purifier is used, let’s say 10,000 dust particles at some point are pulled into the air purifier. Ultimately, only about 3 will be able to pass through filter and remain in the air! That’s an excellent ratio, and reason so many truly enjoy the biggest benefit that air purifiers provide: wonderfully fresh, clean air. Pure air. Simply using an electric fan, opening the window, or using air fresheners doesn’t work because while it may temporarily appear to improve thing, the unwanted toxins and elements in the air still remain there until being removed. A fan can actually worsen your baby’s breathing as a fan can disturb pollutants and materials that have settle on surfaces as dust and will now be re-introduced into the air where baby can breathe more in. How do I use an air purifier for my baby, and how much will it cost? There’s really nothing to do after purchasing an air purifier however it depends upon your needs and the size of the room. Also, some models include additional features that others don’t. Some examples are “auto” mode vs. setting the fan speed manually yourself. There’s nothing required other than placing the purifier in a good location where airflow is adequate (not in a covered are, or too far in a corner low on the ground, for example). I recommend a book case shelf mid-level or on to of a dresser. Once set in place, simply switch it on at the desired fan speed to and let it work at a level that will allow your child to sleep and not be disturbed. Many models like this one produce very little noise so that’s not a problem. Costs include the original purchase price (for a good one for a baby’s room, expect to spend less than $100) and the cost of replacement filters. Most air purifiers for small to medium size rooms use replacement filters that cost around $30 or so and have an average replacement time of about 6-8 months, depending upon use and air conditions. Note that if you aren’t removing a high level of pollutants in your baby’s room often the filter replacement reminder can simply be reset. If the filter isn’t heavily used you can wait additional time before purchasing a replacement. In summary – are air purifiers good for babies? The answer is a definite yes – and they’ll provide cleaner air for a child’s parents as well. Here are some great recommendations for every budget and a variety of room sizes. Are you wondering if a humidifier or purifier is right for your child? 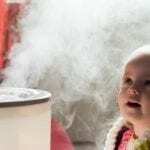 Here’s a great post explaining humidifiers vs purifiers for your baby.